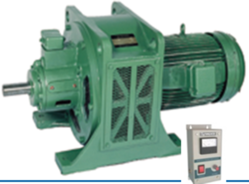 Creating a niche of robust Electro-Mechanical Drives called Eddy Current Drives used for variable speed applications in material handling processes particularly in SUGAR, CEMENT, POWER GENERATION industries, at its best, with utmost quality and totally maintanance free. These are availabe in integral & modular designs for easy mounting. The ratings available are 0.5HP to 100HP with motors (integral) and without motors (modular). The varable speed range is 120 rpm to 1200 rpm. 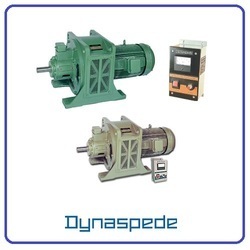 On request,varable speed of240 rpm to 2400 rpm also available. Dynaspede is pioneer in offering fuel handling rotary feeders for boiler applications to BHEL and State electricity generation units. Metallurgical Steel, to resist abrasion... IS:4896; Grade II, duly stress relieved and annealed for permanence of all critical dimensions. 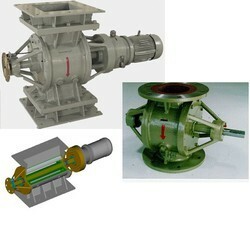 We hold expertise in offering the wide gamut of Eddy Current Brake in the industry. The offered products are used for loading any driving elements like motors, engines etc. This can be used as educational kits for demonstration in various institusions for training purpose. Also, we offered these products at very reasonable rates with intelligent control unit. The modular design, add-on concept of the control units permit most control requirements from simple speed or toque control to complex systems to be effected with maximum economy. The basic control unit...is an Electronic Controller containing all necessary operator controls...common for use with all ratings from 0.5 to 75 HP . Speed holding ability (against load) is better than 2%. Eddy current drives are highly reliable forms of electronic adjustable speed drives characterised by near-zero maintenance and noise immunity. Available in the power range from 0.5 hp to 100 hp with a variety of application-specific control options, eddy current drives are used in speed or torque control operations. We are the most trusted name amongst the topmost companies in this business, instrumental in offering the high-quality array of Eddy Current Drives. Special flange mount type in 7.5HP & 5HP ratings used for fuel feeder in power plant boilers (BHEL & State electricity boards) also available on request.